On February 21, 2016 I posted this photo in The Splendid Sampler Facebook group. At that time I had no experience sewing or quilting. I just started. The Splendid Sampler was my first intro to quilting. I tried every block, for awhile anyway. If the block didn't look the way I wanted or I knew I needed to work on something I would try to search the internet for tips on how to improve and sew it over and over again until I felt like I had it the way I wanted it. I quickly learned that I'm most interested in piecing so The Splendid Sampler with so much applique and embroidery lost my interest. But I found many other things to keep me going! It was fun to look back two years later at the picture I posted in The Splendid Sampler Facebook group and see this comment by a fellow group member: "they are part of your quilting history." That is so true. We all begin somewhere. I have learned so much over the past two years and my piecing and quilting has improved in so many ways. But I know that I still have so much room to grow and I will only get there by trying and doing. I also realize one of the keys to challenging myself and growing is interacting with other makers. When I put myself out there and take that risk it creates more opportunities for me to learn from others. 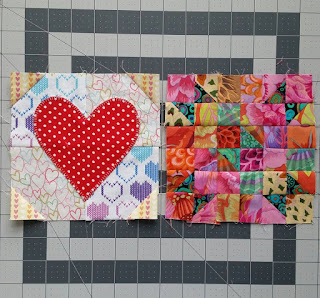 It is challenging for me to connect with other quilters where I live, with my other commitments. I have created great connections on Instagram, but I think I can make even more opportunities for learning and connections through blogging. This is one of the reasons I've stepped up my commitment to blogging this year, as puppy and kids will allow of course. Here's to another two years and more!!! Yep. Keep on blogging Carrie. A lot of us must start blogging in February . It must be the winter. Are you going to join the New Bloggers Blog hop. I'm not sure if there is still room but it's a great experience and will connect you to lots of folks. Lisa I have wanted to do the New Bloggers Hop the last year but didn't blog frequently enough to meet the criteria. This is part of why I stepped up my game, I really wanted to do it!!! I am a little nervous because I signed up before puppy came and took a lot of my quilting/blogging time, but I'm going to give it my best shot!! !